Great book on basic dog training. It was really helpful with learning some of the basic foundational stuff around shaping, training, reinforcement, and especially how to make sure your puppy doesn’t develop bad habits. For dogs, withholding a reward is punishment enough and is, in fact, more effective than physical punishment. Inconsistent training is the most common cause of good behaviors falling apart. A punishment can also be a withheld reward, as long as it reduces the immediately preceding behavior so that it’s less likely to occur in the future. In other words: Peter did punish Wallaby. How? If Wallaby jumped when Peter didn’t ask for a jump, Peter didn’t give Wallaby praise or a treat, but instead turned away and ignored him. Not giving a reward becomes the punishment. We call this a negative punishment, meaning Wallaby’s punishment is that he did not get any reward that he valued (Peter’s attention or a treat). Negative punishment is similar to grounding an older child, giving a young child a time-out, or revoking the much desired television time in the evening. It is taking away a privilege. I highly recommend that you record your dog’s schedule, as well as her progress in meeting your training goals, in a notebook or logbook. For example, you will potty train your dog more quickly and accurately if you know when your dog does her business, when she no longer needs certain puppy potty trips, and how she tells you that she needs to go out. Tracking small improvements will give you confidence and patience. As your dog gets older and her natural patterns change, you start a new log to help you identify new patterns and routines. I recommend that you log everything, including sleeping and napping, waking up in the middle of the night, peeing and pooping, potty accidents, walking, playing, eating treats as well as meals, and even drinking water. If you know what time your dog ate or drank water, it becomes fairly easy to predict when she will need to go potty again. Write down your mistakes as well as your successes. Here is a checklist to help you set your goals. Try picking only your top ten, so that you can get an idea of what is most important to you. The list doesn’t need to be perfect or final; it’s just a tool to help you get focused and specific. My dog is impeccably house-trained. My dog knows where to go potty and goes potty on cue. When she needs to go outside, she gives me the signal that I taught her. My dog obeys the furniture rules and chews only what is allowed. Although my dog likes being with me, she isn’t so needy that she shadows me everywhere. When I leave the house, my dog relaxes. When I return, she is happy and mellow. Sitting calmly is my dog’s way of saying please. He sits when asked and has learned the situations in which I usually ask him to sit. “Down” and “stay” are mastered. When I cue the command, my dog does it without hesitation. My dog loves hearing his name and is attentive when I say it. “Come here” is mastered. When I recall my dog, he comes to me right away. When the doorbell rings, my dog is interested, but sits until cued to greet a visitor. Walking with my dog is joyful and relaxing. She loves walking on a leash by my side, and she responds when I ask her to finish sniffing and resume walking. When my dog is allowed to join me inside a place of business, she has impeccable behavior. I feel like I can take my dog anywhere. Each time you crate and uncrate your puppy, take her outside to potty. I prefer harnesses where the leash attaches at the dog’s chest, rather than on his back. Many breeds treat the top-of-the-back attachment as an invitation to pull, while the chest attachment causes the dog to turn toward you when he pulls. Make sure that the harness fits snugly and check your dog for chafing. I recommend a six-foot leash (instead of a four-footer) so that your dog can get a little extra freedom, especially during exercises when you tether him to your belt. If you’re thinking about using a retractable leash, such as a Flexi, wait until your dog has completed the five-week fundamentals program, has developed excellent recall, and can walk politely at a loose heel. My favorite chew toy is the Kong, because younger dogs love them and yet they are practically indestructible. Most dogs don’t like the taste of bitter apple spray. It works best when sprayed in advance to help teach the dog to keep out of a wastebasket, off a counter, or from chewing furniture. Sitting in a chair (or on the floor if it’s a puppy or small dog), scoop some food into your hand, and let your dog (who should be on a tether or leash) eat right out of your hand. Hand-feed the whole meal to her, and do it for every meal for a whole week. If you have a puppy, you will hand-feed small meals to her throughout the day. While hand-feeding your dog, say her name in a loving way. This is called the Name Game, and I want you to do it whenever you hand-feed. After she eats each small portion that you have scooped from the bowl, you want her to look at you before she gets more food; this will help your dog bond to you and respect you as her food source. This concept—getting your dog used to performing activities in a variety of locations—is called generalizing. Generalizing is a fundamental concept that we will revisit throughout this training program, and it will be applied to every lesson you teach your dog. Hand-feeding will be used whenever you teach your dog skills and new tricks. I often return to hand-feeding to keep my dog fine-tuned, or if he seems to be regressing in behavior or gets stuck on learning a particular cue or skill. The only way to deal with a potty error is to catch the dog in the act and scoop her up and take her, or lead her, quickly outside to the potty area. Until your dog is house-trained, do not allow her to have free access to the entire house, and supervise her always, perhaps by keeping her tethered to you or by using baby gates, x-pens, and closed doors. The goal is to teach your dog that she gets something really great in the crate when you leave (not when you return). Start bite inhibition training by sitting down with your puppy and putting a finger or hand in her mouth. If she mouths on you, say “ouch!” Say it loud enough so that your puppy gets the message, but not so loud that it frightens her. Let your hand go limp; do not pull it out of your puppy’s mouth. When her bite slackens, say “good dog.” Another technique is to tether your dog to a doorknob while you touch her mouth; if she bites, say “ouch” and walk away from her for a moment. (Remember, her punishment is that you’ve taken away the reward of playing with you.) Keep at this “ouch” exercise, building up to massaging your puppy’s gums and counting her teeth. When she starts to lick your hand, gently praise her. Don’t punish her for biting you, don’t clamp her mouth shut or force your fingers down her throat. In this case, you want your puppy to figure it out. Dogs learn better in short bursts of time rather than in a long training session, so I recommend that you spend no longer than five minutes practicing any one exercise. At the end of each exercise, take a break and allow your dog playtime before moving on to another. Remember to vary the location where you practice the exercises. As we discussed with the hand-feeding protocol, dogs’ brains are not naturally wired to generalize cues. Your dog may think that he needs to obey a certain cue only when he’s in your kitchen facing the window on a sunny day with that bag of treats on the kitchen counter. Whenever you reward your dog by allowing her to eat the treat, I want you to also get into the habit of touching her, especially around her collar. Ask your partner to hold your dog’s leash. Put a treat in your hand and take three steps back. Lure your dog by holding the treat toward him, and then bringing it toward your knee. Have your partner release the leash. As your dog arrives, lure him to sit, using the hand motion I described earlier. Once he sits, mark it (say “good”), praise him, and reward him with the treat. If your dog comes to you but doesn’t sit, praise him but don’t treat him. Then back up another three steps and repeat the exercise: Lure him by drawing the treat from his nose to your knee. If your dog doesn’t sit on the repeat try either, do it once more: Praise him (no treat), back up three steps, and try it again. Eye contact is crucial for bonding and for focus, so start practicing this with very young puppies. Pretty soon they’ll be watching your each and every move. To begin, touch a treat to your dog’s nose, and allow her to sniff it. As soon as her interest is established, bring the treat to your eyes, say “good,” and silently count off two seconds. If she stays focused on the treat for two seconds, feed it to her. On the next rep, add one extra second. On each successful repetition, add an additional second. Continue to silently count the seconds, and to say “good” in a happy, rewarding voice. Take a small step to the side before you begin the next rep so that your dog begins to generalize the behavior to slightly different locations. If your dog turns her head or breaks eye contact, move to another position and try again for a second. Do not reward her if she breaks eye contact, or you might accidentally train her to look away from you. You want to train your dog to walk on a loose leash, fairly close to your side. The point of this training session—which should last no longer than five minutes—is to get your dog used to walking on the leash the way you want him to. I recommend that you use a six-foot leash and come prepared with lots of treats. FOCUS FIRST Before you take your first steps together, make sure that your dog is focused on you. Then hold a treat in your left hand and lure your dog in the direction you want to walk. If you have a small dog, get ready to bend down a lot. Start walking forward, allowing a lot of slack in the leash. “BE A TREE” When your dog starts to pull, stop walking, hold the leash tight to your chest, and stand still and firm, like a tree. MARK AND REWARD The moment he looks at you, say “good” and lure him toward you with the treat as you take two steps backward. Praise him, touch his collar, and reward him with the treat. Your timing needs to be precise, so watch for that moment when he looks at you, even if for only an instant at first, because that’s when his attention is returning to you. If he continues to lean forward against the leash without trying to take a step, look for the moment when he slackens the leash and praise that. Stepping on the leash allows your dog to sit, stand (pose), or lie down, but he can’t jump. Say a brief hello and calmly let the person know that you need to focus on training. If you know people with dogs, set up an indoor or outdoor playdate or playgroup. If not, ask your vet or groomer for names of people with well-behaved dogs. As your dog first socializes with other dogs, you may want to consider choosing dogs about the same size as yours, especially with teacup-size puppies. Here’s an exercise I like to do when I train with another person and his dog. Begin by allowing just two minutes off-leash (within a fenced area if outdoors) free playtime. Spend at least 10 seconds praising your dog, and take a few moments to practice the sit cue. Treat her, and then release her for another round of play. It is important that you interrupt the play for three reasons: 1) to help build successful recall, 2) to teach your dog that recall does not mean the end of playtime, and 3) to remind your dog that she needs to keep you as her primary focus. Do this play-and-recall exercise for four rounds. I strongly suggest that you spend at least 10 minutes a day doing a few of these activities and games. The games are also good to shift to when your dog doesn’t succeed at behavior you’re trying to teach. As I’ve stated, dogs learn better with many brief lessons than with one long one, and you can turn 60 seconds into a mini-lesson. Having many short lessons throughout the day will help keep your dog in an always-learning attitude. Add variety and fun to the training experience by playing these games (see details in Chapter Nine): Name Game Eye-Contact Exercise Follow the Lure Pass the Puppy and Peekaboo emphasize bite inhibition, handling, and gentling (assuming that there are no outstanding behavior issues) “Ouch” exercises: explore dog’s mouth, count teeth and toes. Let’s begin with a quick and simple tethering exercise that you can practice for about 5 to 10 minutes every day—you’ll find it a nice break between more difficult exercises. Begin by tethering your dog to your belt, and be sure to have a few treats ready. Start moving around, adding a few distractions along the way. If you’re training inside your home, walk calmly around tables and chairs, go into various rooms, sit and watch television, talk on the phone, browse the Internet, or update your Facebook page with your dog’s photo. While tethered, do a few simple acts like filling your dog’s water bowl, touching the outside of his crate as you walk around it, reaching into his crate and touching his sleeping mat (straighten it up or fluff his bed). If you’re training outside, tether yourself to your dog and move around a small area in a somewhat random pattern: Take out a few objects (like a brush, toy, and towel), set one on the ground and move away from it, set down another object, and another, then pick them up in a different order and put them away. As you do this exercise, notice every time your dog looks at you, mark it by saying “good,” touch his collar, pet him for a moment, and reward him with one treat. Eventually this bonding exercise will become habit to your dog: He will focus on you during walks and while off leash at home or outside. I want you to begin to ask your dog to sit for everything, including her meals. Because you’re still hand-feeding this week, ask her to sit before every scoop of food you offer. Once she sits, it’s okay if she stands up to eat, as long as she doesn’t jump on you or at your hand. Once she’s finished each portion, ask her to sit before feeding her again. Remember to practice this exercise in different places, including in her crate if crate training has progressed to that level. She also will understand that when she does not sit, she gets a punishment: She doesn’t get to hold the toy, eat the food, or walk through the door. As we began learning last week, the sit is your dog’s ready position, and it should become her way of saying “please, may I?” In addition, you want to generalize the cue by training your dog in various locations and while out on walks. The simplest way to teach release is to drop your dog’s leash—assuming that you’re indoors or in a fenced area so that she can’t run completely away—and say “release” or “go play” with a happy voice as you pat her side, then point her to the play area. Most dogs will naturally start to play or wander around until they find a play partner or a toy. Patting her and pointing let her know that it’s okay to do something else now. She may not associate the verbal cue right away, but dropping the leash and patting her serve as her cue. Eventually she will also associate the verbal and physical cue that tells her it’s playtime. Assume that for now your walks will be not much more than glorified pacing back and forth, wearing a groove in the concrete if necessary. Patiently build up to a 30-second walk without pulling, even if you have to start with a 3-second walk before turning into a tree. If you chart the progress in your training log, you’ll be able to appreciate your patience even more. Puppy Pushups are a quick sequence of sit and down and sit, followed by a one-treat reward. The purpose of the Puppy Pushup is to phase out food rewards while improving your dog’s ability to keep her attention focused on you in all kinds of distracting environments. A crucial cue, stay builds your dog’s impulse control, teaching him to stay focused on you even in the face of distractions, which could be a lifesaver. But to get there, you must be patient and your dog must have some maturity. The first step is to master the cookie sit (more on that in a second), because it teaches him to remain seated and always focused on you in the face of a distraction (a cookie). PUPPY PUSHUPS AND SIT Start with your dog on his leash, sitting at the side on which you walk him, and do a set of Puppy Pushups (sit-down-sit) using both verbal and visual cues. Next, hold the leash an arm’s length from where it clips to your dog’s collar, and place that hand on your hip. TOSS TREAT Next, touch a treat gently to your dog’s nose to get him focused on it, then toss it about three feet in front of him. If you have a smallish dog, toss it a bit nearer; if you have a big dog, a bit farther. HAND GLUED TO HIP As your dog jumps for the treat and tries to pull the leash, tense that arm tight against your hip (and use your body weight to keep steady) so that he will have only that arm’s length of leash play. Don’t yank the leash; just keep your hand glued to your hip. DOG REFOCUSES When your dog finally looks at you, mark it (say “good”). Then cue him to sit again, using both verbal and hand signals. TAKE IT! As soon as he sits, say “take it” and slacken the leash so that your dog can reach the treat. He dog will probably dash right for the treat. Mark and praise that, and do another trial. If your dog doesn’t sit right away, don’t give the sit cue again. Remember: Saying “sit-sit-sit-sit-sit” only teaches a dog not to pay attention until he hears the fifth cue. In addition to the cookie sit-stay, the conventional stay technique helps your dog acquire the hand signal for this important cue. 1. SIT AND FOCUS First, start with your dog sitting in front of you and show him an open palm (hand signal for stay). Touch a treat to his nose and then move it slowly to your eyes, to encourage him to keep looking at you. MARK, PRAISE, REWARD After a second, calmly mark “good” and reward him with the treat. While he is still sitting, take out another treat and repeat the exercise, adding time little by little. While teaching the conventional stay, add the verbal cue “stay” and use the hand signal of an open palm close to your dog’s face (or alternatively, wave your hand in front of his eyes) before you give him the treat. Add an extra second on each successful rep until you reach 10 seconds, and then add 2 seconds for each successful trial until you reach 20 seconds, ultimately building up to 1 minute. Beyond 1 minute, add 10 seconds to each trial. Beyond 2 minutes, add 20 seconds to each trial until you reach 3 minutes. At the end of sit training (after you mark, praise, and reward the final successful sit), release your dog and reward him with lots of high-energy praise for sitting so still. 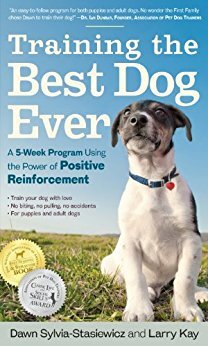 A stay is a great exercise to throw in randomly during evening hours to teach your dog not to beg at your dinner table and to relax while you watch TV or read this book. Prepare a stuffed Kong, request that he lie down, and give him the Kong when he follows through on your cue. After a few minutes of chewing, interrupt him by taking away the Kong. Cue him to sit-stay (for about 10 seconds if he can reliably already do at least that much time), and then mark and praise him and give him the Kong again. After another few minutes, take the Kong away again, cue him to sit and enjoy about 10 seconds of fun together, such as a good belly rub, or a quick round of Which Hand? (see Chapter Nine). Then praise him again and cue him to sit. As soon as he sits, give him the Kong again, and resume what you were doing. Each time you take away the Kong, do something a little different or change the sequence of cues to have him earn it back. This is an exercise for you, not your dog: Your job is to reward good behavior that your dog offers on his own. When your dog does something that you like without being asked, joyfully mark it by saying “good sit” or “good down” or “good stay” or “good heel.” Add praise and, on occasion, a treat or other reward such as a great ear or belly rub. Encourage his good manners now and you will get a spirited, curious dog that volunteers even more good manners in the future. It is simple psychology: What gets rewarded gets reinforced, what gets ignored disappears . . . Yes, it works on humans, too. Start practicing the informal heel indoors, where there are few distractions. First, ask your dog to sit at your side. Say “ready” to cue her to look up at you, and mark and treat her when she does. Then walk forward four steps, marking and praising her if she follows and stays focused on you. Stop and immediately lure her to sit, then mark and reward her. Repeating this sequence (walk-stop-sit, walk-stop-sit) over and over will teach your dog to focus on you with a heads-up heeling gait as you walk together. As you practice this exercise throughout the week, try to change it up to keep your dog interested and to generalize the behavior. Change directions as you walk. If you prefer to do this indoors, walk around objects, like chairs or tables. Try increasing the speed at which you walk, and practice making abrupt turns— not to trick your dog into making mistakes, but to see if you can use your lures and a fun voice to keep him completely focused on you. If you’re consistent in rewarding her for heeling, she will try to figure out how to get more treats and will learn that it happens when she walks at your side. When you reward your dog for staying close to you, she will, over time, be less likely to forge ahead of you to rush into the doggy park, chase the squirrels, greet another dog, or just pull on that leash for no apparent reason. Heeling also promotes good bonding. Whenever you open a door, your dog must wait for you to go through it before she follows you. If she moves out of the sit, immediately close the door and wait a second or two before trying again. Keep doing this exercise until she remains sitting as you open the door, even if it’s just slightly ajar. When she does so, tell her “good” and open the door all the way so that you can lead her through the doorway, with the same signal you use to begin a walk: Perhaps it’s a hand pointing the way or a pat-pat to your thigh as you take the first step. with your dog sitting at your heel and your hand holding his shortened leash tight against your hip, have your partner ring the bell (or knock) and then stay silent. If your dog doesn’t respond to the bell or if he looks at you, jackpot him. Here’s another exercise. Have your child or a friend ring the doorbell over and over again. Ignore the bell—as well as your dog’s barking—until he settles down. When he finally quiets down, wait about three minutes and then casually answer the door to let your child or friend in. You and your human ally should have a calm conversation while walking around your home, ignoring your dog even if he gets excited again. If he tries to jump on either of you, turn away abruptly and keep your back to him as you continue moving away. When he settles down, calmly praise him in a low-key manner, then practice a few sits and downs, staying calm. Next, have your child or friend calmly cue him to do a sit and a down. Watch your dog’s body language, and when he is calm, remain calm yourself and give him a stuffed Kong or a special toy that you have reserved for this occasion. While he chews or plays, resume conversation with your partner, remembering to keep your tone quiet. As your dog sits in front of you, slide your outstretched palm gently toward his face as if stopping traffic, and say “stay.” Keep your hand in position while you intermittently give treats for staying. Mark “good stay,” praise, and reward him with another treat that you have in your other hand. The goal is to teach your dog that the longer he remains in the sit-stay, the more treats he will get. The better he stays, the fewer treats he will need because he now understands what he is being rewarded for. Which Hand? This is a simple guessing game. Start by letting your dog see you put a treat in one hand. Close both hands and put them behind your back. Then bring them both out in front of your dog and say “which hand?” Open the hand that your dog first sniffs or touches; if it holds the treat, he gets to eat it while you gleefully praise him. If he guesses wrong, open the other hand for him to see it for a moment before you shut both hands. Then try another round. This game can be used to warm up a dog for training; once your dog understands the rules, use it if he starts to lose focus. Find Me. This game is also known as Hide-and-Seek for Dogs. Your dog is ready to play this game once she can sit-stay for 60 seconds and can hold her stay for about 10 seconds when you leave the room. Start teaching the game by standing in plain sight in the next room while your dog holds her perfect stay. Then call her name and say “find me.” When your dog finds you, mark that (“good find me”), praise her lavishly as you touch her collar, and reward her. Start the next round from the spot at which your dog just found you. Build up to harder-to-find hiding places and move to outdoor fenced-in locations. Eye-contact exercise. Ask for eye contact at random moments. For example, immediately after you have rewarded your dog for demonstrating a skill, touch another treat lure to her nose to establish her interest, then bring the treat to your eyes and, if her attention remains steady, mark, praise, and reward. If you have established an eye-contact verbal cue, such as “ready,” “look,” or “watch me,” use it in these exercises. Find It. Similar to the game Find Me, this game (also called Find the Treasure) teaches your dog to find an object. Your dog is ready to play this game once she can sit-stay for enough time for you to get out of the room, hide an object, and return (at least 10 seconds). Start with a toy that your dog is interested in, and let her sniff the toy. Then cue a sit-stay and hide the object in the next room; place it in plain sight on the first trial, and on subsequent trials build up to more difficult hiding spots, such as inside a cardboard box. As you progress with this game beyond the Fundamentals Training Program, add naming the object, which teaches your dog to distinguish certain objects. you need two toys that you take out only for retrieving. When that happens—when, say, gifted children must sit through eight hours of lessons that they already understand and are not challenged by in any way—they may become restless, distracted, and frustrated. They may look for things to occupy their minds; often, those things include disruptive behaviors. The Paw Shake Let’s practice clicking on a brand-new skill, rather than on one your dog has already learned, which will also bring us to our first trick: the Paw Shake. As a reminder: I recommend teaching any new trick in a quiet room where there are no distractions. 1. OFFER A TREAT First, with your dog sitting in front of you, let him see you place a treat in the palm of your hand and then close your hand around the treat. Hold that closed hand at the level of his chin, then move it up slightly. Watch closely: If your dog moves his paw at all, then click immediately and treat. As his nose follows the treat going up, his body will try to stretch up to get it, meaning he may move his paws or even slightly lift one. It’s okay if his head stretches up to try getting the treat, because his paw will move, too—even if ever so slightly—and that’s the moment when you click and treat. If he doesn’t move his paw after five seconds, reset to a different spot (for example, turn around) and signal him to do a cue that he already knows, such as a down. If he succeeds, do it again: Whenever he moves his paw, click and open your hand for him to eat the treat. If he fails, ignore it this time: no click, no treat, just start over, no harm done. Let’s say he’s now beginning to move his paw a little toward your hand. Mark the slight paw movement with a click and reward him with the treat every time. Now you will put your open, empty hand in his view. Since he is already moving his paw, challenge him by delaying the click (and treat) until he raises his paw slightly higher, coming closer and closer to touching your hand. When he finally touches your hand with his paw, click and treat him with a jackpot. Once your dog understands what you want and is touching your hand confidently, it is time to name that behavior. Most people like “shake,” so let’s add that word as your verbal cue, while you also continue to use the hand signal. Look for those behaviors that your dog does naturally, because those will be the easiest to shape and put on cue. Sit Pretty (Beg) While the Sit Pretty can be a good exercise for strengthening your dog’s back and core muscles, don’t use this trick with dogs that have back or hip problems, or dogs with long backs (such as Dachshunds and Basset Hounds), because it can put too much stress on the back. 1. LURE UP For this trick, I recommend using a treat lure, although a target stick can also be effective. Start with your dog in a sit, and begin shaping the Sit Pretty by holding a lure an inch above his head. As he lifts his head to the lure, click and allow him to eat the treat. Next, hold the lure an inch or so higher. BALANCE ASSIST On the next rep, hold the lure about three inches above his head. You are, of course, shaping your dog to crane his neck higher and higher to get the treat. Eventually, he will need to lift his paws to eat the lure. Watch his front paws closely; when he lifts a paw, that’s a jackpot. Once he lifts a paw three times in a row, start raising the lure a bit higher still. Keep going up inch by inch, and when he lifts both paws for the first time, that’s a big jackpot. PAWS UP Now try to get him to lift both paws consistently. When he does so, insert your forearm so he has a place to rest his paws for balance. Make that the new baseline for clicking and earning rewards. Eventually, try luring with an empty hand. When he lifts both paws and rests them on your forearm, that’s worth a jackpot—click and treat him with your other hand. Continue the empty-handed luring until your dog seems to have gotten it and becomes fluent. To teach your dog to find his balance without your assistance, begin removing your arm for just a moment at first. Click, praise, and reward him for each increase in the amount of time that he can balance “sitting pretty” on his own. In this trick, your dog balances a dog treat on her nose. On cue, she lets the treat slide off her nose and catches it before it hits the floor. THE BALANCE Start by cueing your dog to sit-stay. Hold a treat to her nose in much the same way as you learned with the cookie sit-stay in the Fundamentals Training Program. When your dog is able to continue sitting still while you hold the treat on her nose, hold the treat a moment longer before you say “take it.” Little by little, increase the amount of time before you say “take it.” When she can remain sitting still for 10 seconds while you hold the treat on her nose, it’s time to add the next step. On the next rep, slowly move your hand an inch away from your dog’s nose before you say “take it,” and then two inches, and then three, and so forth. THE CATCH Don’t allow her to eat the treat off the floor if she misses the catch—that will shift her focus to the floor, where she got the last treat, rather than on you and your directional cues. As you’ll see, not only does this trick help your dog practice impulse control, it’s also a real crowd pleaser—whether the treat slides off her nose or flips into the air. The back up is useful when your dog sits too close to the dinner table, or you’re in a tight parking lot and you need to open your car door for her to jump up onto the backseat. Start with your dog standing in front of you and take one step toward her. If she backs up, click and treat. Take another step, and if she backs up again, give another click and treat. Continue backing up one step at a time, clicking and treating with each step. As you get closer to a wall or obstacle, lure your dog forward to restart the sequence, backing up one or two steps at a time until she is fluent and confident. Next, add the verbal cue (“back up”) and simultaneous hand signal: Turn one hand palm down and gently flick your wrist toward your dog. Practice that one-step and two-step back up using verbal and visual cues together. You’ve probably noticed your dog bowing to another dog as an invitation to play. Lure her toward a down by pulling a treat from her chest to the floor, and click just as her front legs start to bend. In addition to being a fun trick, Circle Me is useful in getting your dog positioned at your heel to begin walking and for general behavior control. START THE LURE Let’s teach Circle Me with a lure. Start with your dog sitting in front of you. Drop your leash if you are at home in a quiet environment that won’t distract him, or tether the leash to your belt loop (giving him enough room to circle around you without pulling on it). AROUND YOUR HIP Click and treat as he moves even with your right hip; that’s his first jackpot. Next, continue to shape his movement so that he circles all the way behind you; that’s his second jackpot. SHIFT THE LURE When he is behind your back, pass the treat from your right hand to your left hand, and continue to lure him toward your left hip; that’s his third jackpot. LURE TO A SIT Finally, lure him to sit at your left side; that’s your dog’s fourth jackpot. Continue to practice this full circle until he is fluent with circling around you and sitting on your left. Many dogs—especially small dogs, young puppies, and herding dogs—love to chase moving objects such as our ankles, trouser bottoms, and fuzzy slippers. If your dog bites your ankles, stop moving and wait for her to let go (or at least pause), then redirect her to sit. Now that you have your dog’s attention, mark it with some calm praise and redirect her again toward a new activity such as a game or a stuffed Kong. If you’re concerned that it seems like you’re rewarding your dog for ankle biting, redirect her to perform a brief series of exercises, like Puppy Pushups or Follow the Lure. Mark the behavior, praise her, and reward her. Whatever the redirected activity, make sure that you reward her, since her ankle biting may be her way of communicating that she needs to feel rewarded and noticed. Make sure to give your dog healthy attention. You may also try deterring an ankle biter by spraying your ankles with bitter apple spray in advance. Make sure to test it for staining. Be aware that bitter apple spray doesn’t change a dog’s behavior overnight. You may need to do this for a whole month, while also practicing redirecting exercises. If you work at home (as I often do), do not let your dog shadow you around the house, to the bathroom, and so forth. Use the crate training protocol even when you are at home.